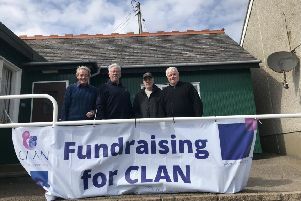 Aberdeen and Stonehaven Yacht Club (ASYB) held their annual Open Day as part of the RYA Push the Boat Out 17 event on Saturday, May 13 at their Loch of Skene base. The weather was not at its best, but the welcome to over 50 visitors were at the event. Many club members helped to make everyone welcome and get nearly 40 visitors out on the water. Most were sailing - often many times over - in double handed dinghies crewed by experienced sailors. One of our safety boats offered RIB rides for the less confident and younger visitors. Smiley faces returned from the water to join club members to feast at the BBQ. There was also an opportunity to stroll through the boat park and look at the many different types of sailing dinghies sailed by club members - from Optimists and Toppers for our youngest members, to fast racing machines, to more traditional sailing dinghies. The Ocean Youth Trust also exhibited on the day and talked with many interested parties about their sea faring adventures. We hope that the visitors will come and join our sailing club soon. ASYC has the unique advantage of sailing in two very different locations during the year. From March to end May we sail at Loch of Skene, here we use the boathouse, part of the Skene towers as our club house. The loch is about a mile across and surrounded by woodland and farms, making for safe, but shifty sailing conditions. From June through to November the club moves to Stonehaven. Sailing out in the bay offers spectacular coastal views including Dunnottar Castle and the occasional dolphin pod. Sea sailing with tides and waves provides a very different challenge from the inland Loch of Skene. Our club house in Stonehaven is on Shorehead, overlooking both harbour and the sea.